(AP) WASHINGON - The Federal Reserve says it will spend $40 billion a month to purchase mortgage-backed securities because the economy is too weak to reduce high unemployment. The Fed says it will keep buying more bonds until the job market shows substantial improvement. The Fed also extended a plan to keep short-term interest rates at record-low levels through mid-2015. 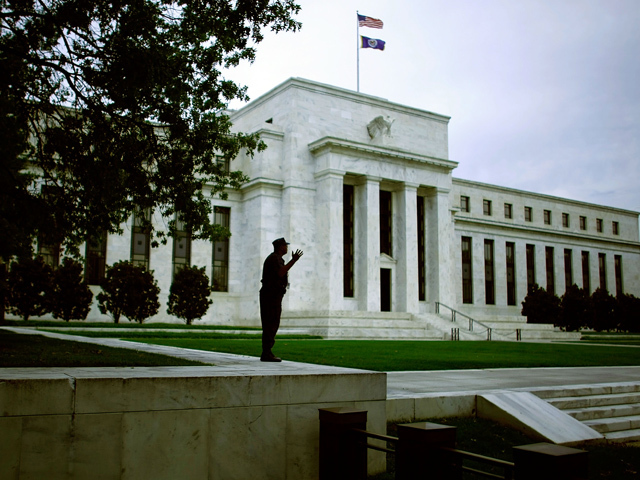 Both steps were announced after the Fed's two-day policy meeting Thursday. Stocks rose after the Fed announcement. The Dow Jones industrial average was up 15 points for the day just before 12:30 p.m. It surged by 105 points within minutes of the announcement, then gave up some gains to be just 35 points higher. How does "quantitative easing" work? The dollar dropped against major currencies, and the price of gold shot up about $16 an ounce, roughly 1 percent, to $1,750. "If the outlook for the labor market does not improve substantially, the committee will continue its purchases of agency mortgage-backed securities, undertake additional asset purchases and employ its other policy tools as appropriate until such improvement is achieved in a context of price stability," the Fed said in a statement released after the meeting. The bond purchases are intended to lower long-term interest rates to spur borrowing and spending. The Fed has previously bought $2 trillion in Treasury bonds and mortgage-backed securities since the 2008 financial crisis. Skeptics caution that further bond buying might provide little benefit. Rates are already near record lows. Critics also warn that more bond purchases raise the risk of higher inflation later. With less than eight weeks left until Election Day, the economy remains the top issue on most voters' minds. Many Republicans have been critical of the Fed's continued efforts to drive interest rates lower, saying they fear it could ignite inflation. The Fed is under pressure to act because the U.S. economy is still growing too slowly to reduce high unemployment. The unemployment rate has topped 8 percent every month since the Great Recession officially ended more than three years ago. The unemployment rate did fall to 8.1 percent from 8.3 percent. But that was because many Americans stopped looking for work, so they were no longer counted as unemployed.